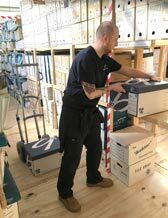 At Ingram's we offer a professional document storage and archive services at your location - be it local in Bishop Auckland, Durham, Darlington, County Durham, Tyne-and-Wear, Northumberland, Cleveland, Yorkshire, Cumbria or Nationwide - for both domestic and commercial clients. 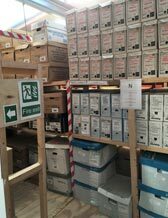 Please contact us for advice and further information about storing your personal or business documents - we will also provide literature free of charge. When you use this system your document and archive are packed at your office, business premises or on site. 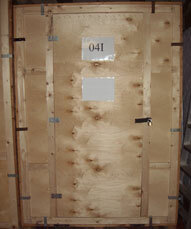 Then they are loaded straight into one of our secure containers/locations at our container stores. Our premises are fully burglar alarmed and fitted with CCTV. 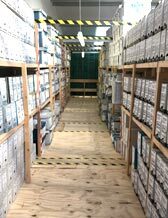 At our document storage premises we have a wide range of facilities to aid you in storing, retrieving and managing your archive portfolio. 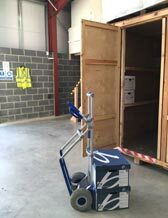 Inspection area: We can organise an inspection area/container for you to use whilst inspecting the contents of your documentation and archive. Open space storage: Larger or awkward sized items can be held in an open space area - usually for larger boxes and paper sacks. Containers: we have standardised containers for maximising your document storage. 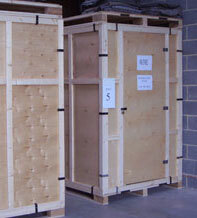 Our Document and Archive containers are suitable for storing standard document storage boxes and archive cartons. Anti-luce fittings insure easy closure and opening of doors and security can be provided by the use of padlock or seals. The containers have the dimensions 218 x 2440mm and are produced on a one-piece multi-laminated 18mm plywood base. 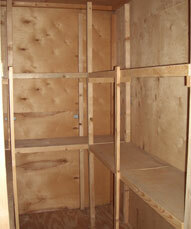 The inside of the container permits walk-in central access to a Two Tier Shelving System. This shelving can be adapted to store computer hardware and any other office equipment. 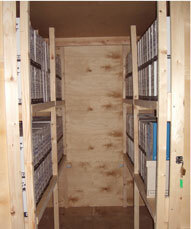 Racking: Our stand-alone racking is walk along with 3 tiers/levels - optimised for our standard archive boxes. Separate areas are spread throughout the warehouse and access is restricted. Filing Cabinets/Drawer Units: you have the option of utilising filing cabinets that can be secured with locks or pad-locked latches. These would be located within secure bays within the storage unit. Fire Safe: For highly confidential and sensitive data we offer a restricted access location that is ideal for your smaller archive and digital data/security items such as USB memory drives, Hard Disk drives, tapes, etc. Rest Room: We offer a hygenic and comfortable area for use whilst carrying out operations on-site at our storage facility. 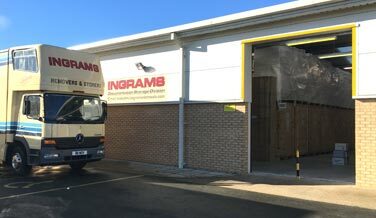 Security - Ingram’s have 2 document storage sites in Bishop Auckland both of which are situated within the confines of secure warehouses, our stores are fully alarmed and fitted with sophisticated CCTV. 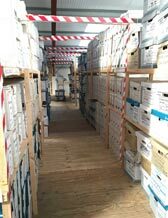 Space Saving - Free up valuable office space by storing archive documents for easy access to view documents and files in the confines of your own lock up container within our secure depositories. Confidentiality - Walk in shelved containers. Each individual container comes complete with a lock up door. Keys and a recorded reference number are retained by the client to maintain complete confidentiality. Clean and Personal - Completely dust free and unlike ‘open shelved’ storage only the client themselves can gain access to their sealed container if so specified. Local Courier - delivery / collection service to and from your office at Short notice. Carton Supply - Purpose made document cartons sold at highly competitive rates. Cartons are already labelled for clients to enter full details. Please contact us to view a sample carton. Secure Disposal - Disposal of confidential and unwanted documents. Ingram’s are licensed carriers of waste. We offer a comprehensive shredding service to dispose of all your disused documents via a locally renowned environmentally friendly shredding company. Upon destruction of documents the client will receive a certificate of authenticity from us. Inspection/Work Area - Secure workspace available for clients to inspect confidential document carton contents. Personalised Packages - We cater for the individual needs of our clients, so please contact us regarding any aspect of our document storage and archive services. Or better still please call in and see for yourself the comprehensive service we offer. 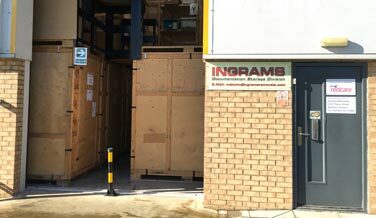 GDPR Compliance - From the 25th May 2018, Ingram's have achieved GDPR compliance for their Archive Storage operations. Details can be found in Ingram's Removers and Storers - Privacy Notice. Our system eliminates handling as the contents will not be touched again until you access them again - unless of course you ask us to do some operations on your behalf. Once in store, your goods are safe, dry and dust free. When you are looking to store your precious documents and archive always insist of viewing a storage companies premises. At Ingram’s we are proud of our facilities and welcome the opportunity to show prospective clients the facilities we offer. Don’t always believe what you see when trawling the internet. At our main Bishop Auckland storage depot we are now proud to offer a new self-storage facility to selected clients. 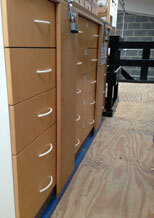 Each container comes with full shelving where you secure the contents personally by the use of a padlock or seals. Each container has a storage capacity of 250 cubic feet. The contents of the containers are fully insured as they are held within our main warehouse unit - declaration of items stored within these containers is required. Access to the container is available at any time between 9am-4pm Monday to Friday. A minimum rental of 4-weeks is required for self-storage and payment for this initial period must be paid up front. We can provide on request a full range of packaging materials and storage boxes that will let you take the best care of your items. Other self storage companies offer a variety of services and prices. We believe that we offer a convenient and competitive package - please contact the main office or send a message using the contact form for more information or to arrange an appointment. Ingram's has also received a Certificate of Environmental Accomplishment for it's contribution during 2010 to their shredding and recycling plan, with the aim of saving our environment - view the certificate. Depositing goods is just like opening a bank account. So only in exceptional circumstances may people other than the signatories to the original warehouse contract give instructions. Due to new laws introduced by the FSA in 2005 we no longer sell insurance. Clients are now covered through our liability which is fully approved by the British Association of Removers (BAR). Please contact us with any queries. If there are some items you may need back before others, inform our estimator when he calls to make the quotation. On moving day, it's sensible to remind the foreman and he will plan the packing accordingly. If you leave it as an after-thought, it can be expensive! What should not go in store? Never send precious items such as jewelry, money, deeds, coins or collections into store. Movers cannot accept hazardous goods such as paint, aerosols, gas bottles or other potentially dangerous items. Obviously, no plants, food or animals should be sent for storage. We also recommend that everything going into store is clean and dry - so think about any items that live outside the house and get them ready well in advance. Send mail to info@ingrams-document-storage.com with questions or comments about this site. Page last updated on March 25, 2019 .